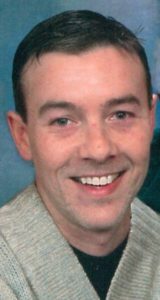 Corey M. Ludwig, 41, of Mountville, passed away Monday, February 4, 2019 at his home. Born in Lancaster, he was the son of Richard and Mary Louise (Kiscadden) Ludwig. He attended Hempfield High School. Corey was a welder by trade and worked at several manufacturing businesses in the area. Corey loved his Super Bowl champion Philadelphia Eagles. He was a funny, loving and caring father and son. Above all Corey loved his children Carter and Candace very much, and he enjoyed every moment with them. God bless him and hold him in your heart. You are with your brother now. Dad, Mom, Carter and Candace and the rest of your family will miss you very much. Watch over your children. Corey is survived by his children: Carter Ludwig of Mountville, Candace Levengood of Elizabethtown and host of loving extended family. He was preceded in death by his twin brother, Troy Michael Ludwig. In keeping with Corey’s wishes there will be no formal services. In lieu of flowers, contributions in Corey’s memory may be made to the West Hempfield Twp. Fire & Police Dept., 3476 Marietta Ave, Lancaster, PA 17601. Dear family of Corey, May God wrap you in His loving arms and hold you tight! I had the privalidge of meeting him and his children, what a wonderful heart he had! I will be keeping all of you in my thoughts and prayers for comfort and peace always!! May you also know that you shall meet again someday. God bless!!!! My heart breaks for you as you lose another son way too early. While I don’t know the circumstances of Corey’s death, I know the challenges you have faced these last few years. For what it’s worth, I have found good support in my own grieving from the Pathways Center for Grief & Loss run by Hospice and Community Care. Everything is free and available to anyone who wants to attend, no matter if you used Hospice’s services or not. I would urge you to call, have them send you their newlsetter. and consider attending their newly bereaved series and/or support groups. You can reach them at 717-391-2413 or online at www.pathwaysthroughgrief.org. They also run programs for children and young adults. My thoughts are with you and Corey’s children. Take care of them, each other and yourselves. It’s been almost a year since I lost Joe. I have learned that there is no timeline on grief and that allowing friends and family to support you helps them and you learn to smile again, as you remember happier days. My condolences to the family — Corey was a sweet man – i will miss you – Hopefully you are at peace now. God Bless your soul Corey, you’re now at peace and with eternal love and grace. You will be missed here and God be with your family in their time of loss. Sleep well my beautiful nephew. I will cherish so many good memories with you. More dearly then the spoken word I will miss you always and hold you in my heart.. rest in peace my love.